Do you think Aakash Tablet PC Failed to keep their promise? Aakash, the world’s cheapest tablet is trying very hard to deliver their product ? 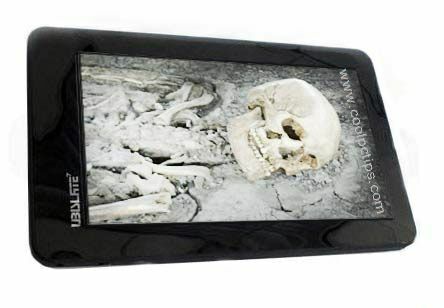 We are in the second week of January 2012 and still no news of Aakash Tablet. The Data Wind Company said that they will start the delivery from January 2012. But as usual they didn’t keep their promise. It was really surprising to know that they are still keeping the slot open to book Ubislate 7. I guess if we book now, it will be delivered somewhere around end of May 2012. Because, they said if you book in January, the tablet may be delivered by the end of March. Since they promised it as march, you can add two more additional months and get it by May 2012. And that too it is not confirmed that the tablet will be delivered by the end of January for people who have booked it in the month of December 2011. The main reason to discuss about the poor service of Aakash and Datawind is their negligence towards people’s queries and mails. There are around 40 websites with Aakash domain name stating them as the official site. Out of which 38 are fake and the remaining two are the official sites which are of no use. You can find hundreds of comments and mails on our Aakash posts. Each and every comment is replied by Coolpctips team. Doesn’t the Datawind Company feel the minimum responsibility of replying to people who send them mails? At-least an automated message can keep them waiting. To be frank, I guess there is no proper and well structured customer service team guiding the people who have booked the Aakash Tablet. At least an official press meet can give people some hope. Which the Datawind company is not trying to do. They might be busy with their deliver data coming close. But a official statement saying that the tablet will be delivered in so and so time will be fair enough to keep a hope. Last year in 2011, Aakash was the biggest technology news in all over the world, now it has been the biggest failure in whole world. With its poor customer service response, the tablet has become nothing more than a big fail. When the official team has announced that people can book the tab, guess they didn’t expect the response to be this big. Because in 14days, people have ordered over 15lakh tablets where each unit is priced with a tag of Rs: 2500/- Seeing this amazing response, Data Wind has decided to open 3 new factory centers in Cochin, Noida and Hyderabad. As per my knowledge, Data Wind is ready with one factory in Hyderabad which will be leading by Quad, which is making LCD for this Aakash tablet. The Datawind CEO Mr.Suneet Singh Tuli has announced that once the factories are in their place, they will be able to make 70,000-80,000 tablets per day. This seems to be a tough task for me. It’s really good that Datawind doesn’t want their customers to pay the money online. As there are hundreds of fake aakash sites now in internet, it is really easy to fool people to pay money saying this is official site of Aakash tablet. Let’s wait for the official statement from the company to give some official statement of when they are delivering the product to their users. Recent news say that Aakash had a record of over 900,000+ pre-sales in 2011 when compared to all other tabs which were sold out around 300,000 in 2011. These 300,000 tablets include all Apple, Samsung, and other popular tabs. Seeing this huge demand for Aakash in India, the company should really take some serious action to improve the delivery date of the product. If Aakash is compared to any random low performance tablet in world, it got the cheap resistive touch screen and a slow processor which is very disappointing for a 2012 techie guy. But at this price, it is the best tablet which any student would love to have. Even though it received about 1, 00,000 orders a day, the craze of Aakash tablet is still the same. People are expecting Aakash to be the next iPad in India. Where in the cheapest model of iPad is 12times costlier than Aakash. 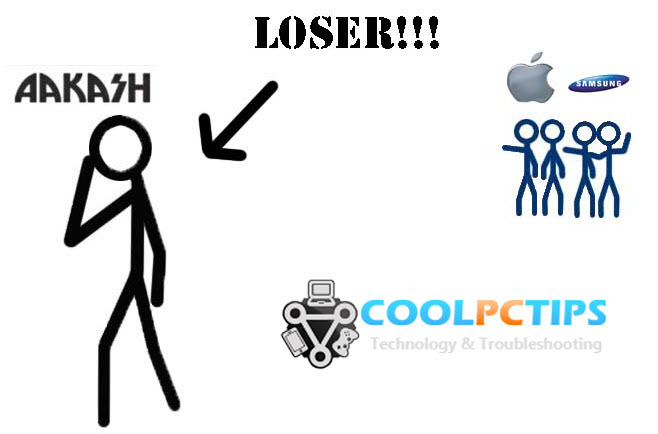 So, expecting Aakash to be substitute of Apple iPad would be nothing more than a sin for sure. There is a proverb called, the more wheat you add, the more bread you get. This is for people who are expecting too much from a poor Indian Tablet. Keep in mind that Aakash can never replace any other tab released in India. What you are getting in 2,500 is a real gift for the people. Lets, be happy with what we are getting now. The only replacement to Aakash can be its newer version called Ubislate 7. This comes with a 700 MHz processor which is an upgrade to 300 MHz in Aakash Tablet. The government of India has promised that Ubislate 7 will be out in market with amazing exceptions. But, it is a million dollar question when it comes to deliver the product in less time. People are feeling embarrassing when someone talks about Aakash now. Because they are tired of waiting for the tab from 3months. Let’s take a look at the Performance of Aakash which you have to read for sure. You will get to know why this tab is a tagged with a price of Rs:2,500. In the above section of our post you have read about the poor service of Aakash. Now let’s find why Aakash is a fail in terms of technology and revolutionary gadgets. To be frank, Aakash is not at all worth spending Rs: 2,500. The actual cost of the device will not cost more than Rs: 1500. Well that is not the point now, the main point is, and we have lot of hopes on Aakash. But is it really worth? Let me give a detailed answer with a No. I want to tell you few basic facts about Aakash tablet. Later, it’s up to you to decide if Aakash Tablet PC Failed or still a super hit. 1) Hidden Costs & Pricing: There are few hidden costs when you are buying Aakash. Try to find them here; you have to buy these below things to use Aakash effectively. The device will cost you Rs: 2500 + an Extra shipping which costs you minimum Rs: 200-300, you should buy a minimum of 4GB Micro SD card which will be around Rs: 400 – 900 and there will be no Earphones – Rs: 300 – 400. Total – Rs: 3800 – 4000. 2) Slow Processor: I personally don’t think that Android can work efficiently on a 366MHz processor. The processor in Aakash is the biggest drawback of the device. You can’t run more than 3 apps at a time. Even though you try to run them, the result we all know. Restart the device..The processor is heating up very fast when compared to other tabs. If you are using Aakash for more than two hours, then you will feel that you are holding a stove in hand. 3) Limited Memory: You cannot store much data on this device. There are a lot of amazing android apps in market which require minimum 8GB card. In our Indian market, a 8GB Memory card is somewhere around Rs: 999.. So is it worth spending almost all Rs: 1,000 for a memory card? That too for a 2,500 tab? I don’t think it will work. Even if the tab allows 32GB storage, you cannot afford to buy a Rs: 5000 memory card for a tab which is half the price of the memory card. Because you don’t have enough memory, you cannot store more movies, data and music on the tablet, which is a waste. 4) Low Battery Life: Aakash has got 2100 mAh battery which can give a battery back of hardly 3hours. So, for every 3hours you have to charge your battery? Then when are we actually using it? The situation would be worst if students are fighting for switch boards in college to charge their devices for every 3hours. If the screen size is not 7″ then the 2100 mAh would have the best battery for Aakash. Now it seems that the battery will disappoint many people. 5) Bad Display & Touch Screen: Trust me; Aakash is nothing great when it comes to its display. The basic display which has no HD output is really horrible to watch a movie or a video. The screen will reflect the light and also it’s over brightness. To my knowledge, you can never see what’s on your screen if you are under the sun. And also the touch screen is too resistive. You need to press the screen very hard sometimes to get your work done. So, don’t even think of playing a game on it. 6) No Bluetooth, No USB dongles: You cannot access your 3G dongles like Airtel, Idea and Reliance in your Aakash tablets. I still didn’t understand why they have given 2 USB ports when there is no USB dongles support. We hardly use one for the Pen drive. Also there is no support for Bluetooth or IR to send and receive data. The only possible way to copy data is the USB port used to insert USB drives. 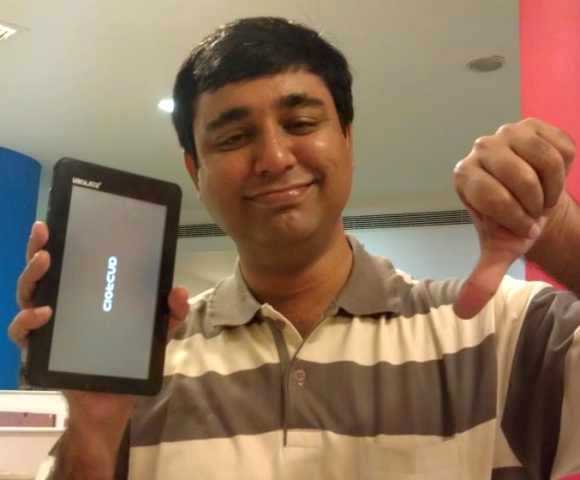 7) No Android Market: Yes, there is no android market support to the Aakash Tablet. It will limit to very few apps. If you are a techie guy, you can install the market on this tab in minutes. But what about people who are in rural areas and what about students? Well, the answer is you can’t do anything. Just they have to adjust with what they got. If you want to install any new app, you have to spend some real time. 8 ) No Hardware Support : You cannot upgrade your tablet to newer versions of Aakash. This means, you have to fix only to android 2.2 through out your life. This is really embarrassing when you show it to your friends. If you are trying to upgrade to android 2.3 or some other versions, first try to check the processor speed and other requirements needed to install it. I am sure you will be disappointed. Because the future versions of android require minimum of 700 MHz. 9) No Speakers: The first thing is, you are not getting any headphones to listen to audio or watch video on your tab. and secondly, you don’t have any external speakers to listen the audio. So, this is another minus point in this tab. 10) Operating System: You will not be satisfied with android 2.2. Because now where ever you see any new phone or tab, they will have minimum android 2.3 or 4.0. Your processor in Aakash will never support any upgrade apart from Android 2.3. This will make you feel irritating which is another bonus and apart from this, you can find a bad logo design behind the back of Aakash which is very ugly. You feel like holding a govt. laptop filled with stickers and bar codes. Trust me, for a Rs:2,500 tablet, these performance from a tablet is quite natural. These are the few drawbacks of Aakash which will never fulfill people’s requirement. But still we have some hope that at least we are trying to put our hands on a tab which really has been the hot favorite of year 2011. We hope at least the service should be good from the Datawind company when the product is out and ready to use by the people. If Datawind Company is not showing any respect to their buyers at the beginning stage of the tablet release, then Aakash tablet will not survive much days in the Indian market. They are concentration only on building the product. But the key factor is missing, which is nothing but proper customer support and a healthy relationship with its users. I know that its very difficult to give replies to all 15lakh customers to tell when the product will be delivered, but still they have a alternative of announcing it in a press release or at least with an automated message to all their customers. And I am very sure that it is not worth to wait this much for a ordinary low quality tablet. Please share your feelings and queries below. We will find a way to answer it and tell you why Aakash Tablet PC Failed in India. Dude is there any shipping charges at the time of delivery for ubislate 7+ (Rs.3000/- tag one)?? Yes, there will be.. Expect a shipping charge of rs.200 minimum. Ya,,,Thats Obvious You can’t expect much from a Tab of Rs. 2500.. But still it’s a dissapointment And a failure.. Please give me some name of TABLES which has SIM(GPRS) facility,camera, Bluetooth, USB dongles/PORT WIFI, android 2.3,good processor, sufficient memory with affordable price (5000 to 7000 thousands) in Indian market. This really worries me. I guess they need make an upgrade to improve its performance. It can’t survive in environment like this, people can buy cheap tablet like Kindle instead. in delivery we must purchase headsets,memorycard etc..? I am Sending here with DD No : 261044397.Drawn on SBI for Rs 3000/-. dude i am also in hyd, jst wanted to know did u get ur tablet? I booked Ubslate7+ on 4th-Feb-2012. In which time i gote this ubslate7+? My booking id-PMB5FABAB53. Please, inform me throtgh my email that is- debashis330@gmail.com. Fake bookings hai fake Tablet hai chinees company ko order diya tyhya enhone jo ke cancel ho gaya …aur booking kar ke baithe hai ..quality be bahoot ghatiya hai ..mai enke office gaya waha total 5 ka staff hai including chairman …..enka businees sirf broker hai …actually me enki koii production hai he nai jo adverties kiya wo available he nai ho paa raha hai maine pichle ek saal me kum se kum 50 bookings ki per aaj tak kisi ka response nai aaya hai ……enke pass tablet nai hai sirf promises hai …aur es year ke end tak bhi jo pura nai hoga chhodo en ko …chinees tablet kisi layak nai hai ……….. ..online status booking check bhi sirf dikhane ke liye hai waha bhi kuch nai hota ghatiya hai ye ..aaj tak sirf government ko chhod ke ye kisi ko bhi deliver nai kar payee aakash tablet /UBI slate ..na too enke pass production ka paisa hai aur na he ….chinees se kharid ke bechne ka ….sirf dalali hai aur kuch nai …bekar me time aur paisa mat bar baad karo ye ek fake compy hai ….. I have received Ubislat7 Tablet PC thro M/s Bharat Telecom India P Ltd. on 16/4/2012 against above order. 1) Battery found gets exhausted every time I shut down the Tablet though it is charged for 4 Hrs every time as per your manual It is getting charged after 8Hrs too. i have book my ubislat 7 in feb-2012 . when will i get it? (GIBY ALEX ) have booked Aakash tab (For my Wife Sumi Elizabeth Joseph) (a project sponsored by the Indian Government, Ministry of Human ResourceDevelopment)in the month of 4th JAN 2012 and was given booking ID ” PM5C557DB41B. I have got a mail from them saying if I decide to make the payment in advance they will prioritized my delivery of Ubislate7+ in May or June 2012, along with free shipping. The payment was made through my cheque no. 040924, Bank name :HDFC Date dt. 23-MAY-2012 amount Rs.2999, drawn on HFDC bank which was cashed by them during last week of May 2012. . Till now of June 2012, I did not get the product and emailed them But its 16th June 2012 as I write this, I did not get the product till now. They have stopped replying to my emails, online enquiry/complaint. They do not answer or pick up helpline number 1800 180 2180.